Kazuo Yano, Corporate Chief Scientist of Hitachi and a member of AI World Society Standards and Practice Committee will deliver the AI World Society Distinguished Lecture for 2019. Much of Yano’s watershed work has been focused on quantifying happiness through the deployment of artificial intelligence and big data and applying that knowledge to the corporate environment. 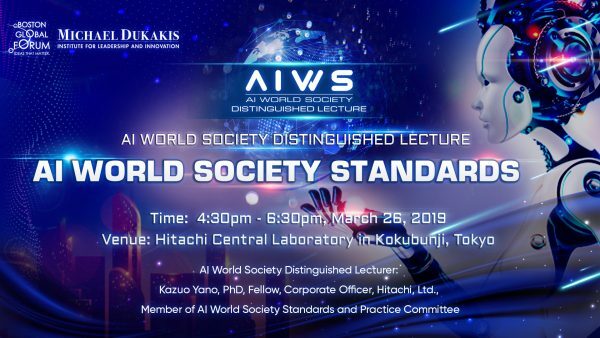 Yano, who is a visiting professor at the University of Tokyo, will speak at 3:30 pm – 5:30 pm, March 26, 2019 at the Hitachi Central Laboratory in Kokubunji, Tokyo, and will focus on establishing AI World Society Standards. Also speaking will be: Mr.Yuichi Iwata, senior researcher from Nakasone Peace Institute, Mr.Kei Yamamoto, president of D-Ocean and Mr.Yuji Ukai, the president of FFIR. Yano is widely regarded for his pioneering work in semiconductors, such as the creation of the first room-temperature single-electron memory in 1993. He also pioneered measurement and analysis of social big data and is the author of, “The Invisible Hand,” one of the top ten business books published in Japan in2014. Each year, the Boston Global Forum and the Michael Dukakis Institute organizes – The AI World Society Distinguished Lecture to honor those who have made outstanding contributions in AI that are associated with fostering the Artificial Intelligence World Society (AIWS) 7- Layer Model. The AIWS Distinguished Lectures focus on ideas and visions of the honorees that brought them to their current position of achievement and highlight, their contribution to shaping the future. The lecturer will be awarded the Certificate of Honor—the AIWS Distinguished Lecture from the Michael Dukakis Institute for Leadership and Innovation (MDI) and the AIWS Initiative. The annual lectures are retained as part of the historical records at AIWS House, published in an e-book and featured in a special section of the Shaping Futures Magazine. Boston Global Forum (BGF), based in Boston, Massachusetts, was founded to bring together the world’s thought leaders and experts to participate in open public forums to discuss and illuminate the most critical issues impacting the world at large. BGF’s principal mission is to provide an interactive and collaborative world forum for identifying and developing action-based solutions to our most profound problems. Its method is to host gatherings of thought leaders and experts to identify and explore the most pressing societal concerns and propose creative and practical solutions.